The E320 instrument cluster. We offer an instrument cluster repair service that addresses those dead pixels in the shift selection / temperature and date / time areas. Send your instrument cluster to us and we correct the display problems. 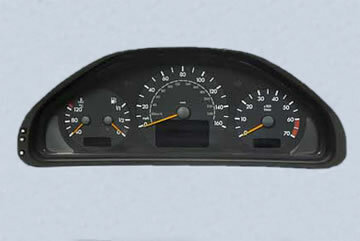 See our "Mercedes Benz instrument cluster speedometer repair" on e-bay for complete details. Note this repair is guaranteed for life to the original purchaser of the repair. For MB C230 C280 CLK320 CLK430 CLK55 G500 E320 E430 E55 vehicles.